Close up of plate-like tree bark on Ponderosa Pine. The Big Pines Nature Trail travels among mature stands of Jeffrey and Ponderosa pines. The north-facing forested slope of Blue Ridge is off to the right. Looking out at Wright Mountain on the far east end of Blue Ridge. Mature stands of Ponderosa and Jeffrey pine are in the foreground. North Tower. This is what remains of Davidson Arch, built back in 1926. The arch spanned the highway, providing a pedestrian overpass for the many visitors to Big Pines. The arch was torn down in 1950 to accommodate the widening of the highway. This benchmark, placed next to where the north tower of Davidson Arch is located, marks your elevation at 6,861 feet above sea level. As you can see, it was placed here 93 years ago by the surveyors! and even in the winter and early spring can still be comfortably warm while snow still clings to the north slopes of Blue Ridge. Because of this slope’s southerly aspect, you’ll find sun loving plants such as Yerba Santa, Parry’s Manzanita and Fremontia (flannel bush) to name a few. Yet, you’ll still enjoy the welcome shade of Ponderosa, Jeffrey pine and leafy black oaks (Kellogg). There are some good spots to sit down and rest awhile and think about nothing. Upon your return, don’t forget to poke your head into the door of the visitor center, located on far right side of the porch of the old Big Pines Lodge. Presently, the center is staffed by the U.S. Forest Service Friday through Tuesday, providing information on local places to visit and hike. Looking down into Sawmill Canyon while descending the Blue Ridge Trail. Photo taken just below Blue Ridge Campground. That’s Pinyon Ridge out in the distance. It’s already far enough into the Spring to do the Blue Ridge Trail hike in Wrightwood, CA. Yesterday, Joanie and I worked our way up the Blue Ridge Trail, which begins across the street from the old Big Pines Lodge just a few miles west of Wrightwood. The air was fresh (mid 40′s) as shredded white clouds blew fast to the north over Blue Ridge. The Blue Ridge Trail is 2 miles in length and climbs about 1,100′ between Big Pines and Blue Ridge Campground. This trail hike is a pleasant climb, in many places contouring shaded slopes and occasionally poking into quiet little side canyons filled with willows. Much of the view is of the Swarthout Valley which cradles the little mountain village of Wrightwood. A section of the Trails of Wrightwood – Big Pines map is being oriented to the local landscape. This photo was taken on the lower end of the Blue Ridge Trail between Big Pines and Blue Ridge Campground.Mexican border all the way to Canada, is also met here at the campground. Mexico border all the way to Canada passes through the campground. You can return back down the mountainside, the same way you came up, or make a loop out of it by taking the PCT (Pacific Crest Trail) toward Inspiration Point and then cutting off onto a dirt access road which descends back toward Mountain High West ski area. This route can be seen on both the Trails of Wrightwood – Big Pines map or Tom Harrison’s Angeles High Country map. Regardless of which way you do your return trip, you’re sure to enjoy passing through healthy and mature stands of black oak, jeffrey pine, ponderosa pine, sugar pine and white fir. Morning light on flowering lupine. Photo taken about midway between Big Pines and Blue Ridge Campground. John Steinbeck in his younger years. One of his timeless novels is “The Grapes of Wrath.” Published back in the 1930′s, this fiction follows a grouping of families who take their chances in California as a result of the dust bowl disaster of Oklahoma. years I occasionally connected Steinbeck with this observation of the San Gabriel Mountains, as observed along Route 66, the “Mother Road”, traveled by thousands and thousands of migrants migrating to California from Oklahoma’s 1930′s dust bowl. Had I really read that? Well, this morning, I found the passage just after finishing breakfast on this last day of March. Here’s an excerpt from John Steinbeck’s novel, Grapes of Wrath, page 152 (Penguin Books, reprinted 1987). Imagine yourself driving that asphalt two-lane heading for California and the unknown. Steinbeck is, of course, describing the southward view from what we now know as the I – 15 freeway, probably near Lenwood. His “good mountains” are the San Gabriels and the pass happens to be the Cajon Pass. The San Gabriel Mountains seem to have always held an allure as the “good mountains” to head towards and be in. I wonder what John Steinbeck’s connection to the San Gabriels happened to be… More to follow. Steinbeck’s, “The Grapes of Wrath.” This page describes a portion of Route 66, the ‘Mother Road’, which travels from Chicago, Illinois to Santa Monica, CA. Page 152 makes a reference to the San Gabriel Mountains of Southern California as “the good mountains.” The next sentence reads “Then suddenly a pass, and below the beautiful valley…” This is the Cajon Pass and the following downslope Inland Empire towns such as Cucamonga, Etiwanda, Upland and more. Cover of Grapes of Wrath by John Steinbeck. As you can see, this little book of ours has gotten a bit of wear. Here’s a close-up image of a bough of Limber Pine (pinus flexilis) taken near the summit of Mount Baden-Powell. Some of these trees found high, about 9,000′ elevation, on this mountain slope in the eastern San Gabriel mountains range in age from 1,500 – 2,500 years. Look for needles numbering five within each sheath, smallish cones and white, cordlike branches that are very flexible. The trees are not terribly tall and sometimes appear shrubby and very wind bent. The Mount Baden-Powell hike is featured in the Trails of Wrightwood – Big Pines Map, as well as 19 other trail hikes in the surrounding area. The map is hand-drawn on weather-proof map paper. Unfolded, it measures 19″ x 28″, giving a clear sense of how many of the trails are laid out in this part of the eastern San Gabriel Mountains high-country. Contour lines have been purposely omitted, presenting a clear and uncluttered appearance. Just click on www.hikewrightwood.net to see details. Late summer and fall are both good times of the year to hike up this beautifully forested mountainside. Joanie Kasten framed between two ancient limber pines as she nears the summit of Mt. Baden-Powell. You start out at Vincent Gap on the Angeles Crest Highway in an area of red soil, sort of like a color you’d see in New Mexico. In 38 switchbacks you’ll climb 2,800′ to the top of the windswept summit. Less than half way up, make sure to stop at Lamel Spring and check out native wildflowers, such as Shooting Stars and Crimson Monkey flowers. About 2/3 of the way up to Mount Baden-Powell, you can see a smoke cloud behind East Blue Ridge. We thought that the fire might be near Wrightwood, however, it was way down on the I-15 Freeway in the Cajon Pass. Notice the deer brush and Lodgepole pines in the foreground. One of the great reasons to do this hike is to experience forest transition the whole way up. Start your hike out in scrub oak and lots of jeffrey pine. Soon, you’ll be experiencing stately sugar pines with their long, glistening cones hanging from the tips of broad horizontal branches. Next, you’ll travel through stands of lodgepole, nearly perfectly straight in stature, with a myriad of tiny cones covering the forest floor at their base. As you near the summit, start to look for the ancient limber pines, which have been buffeted by the storms of wind, rain and snow for centuries. In some cases, 2,500 years! Whatever your reasons for doing the Mount Baden-Powell hike, you’re sure to to enjoy majestic panoramas of the Mojave Desert to the north along with a view of the rugged peaks of Pine Mountain, Dawson Peak and Mount Baldy to the east. Come back refreshed. Here’s a view looking out toward the Mojave Desert. Photo was taken just below the summit of Mount Baden-Powell under the shade of an ancient limber pine in the late afternoon. Notice the trail sign in the foreground, marking the intersection of the P C T (Pacific Crest Trail) and the final few switchbacks to the summit. This is a view looking into the Big Horn Mine’s upper adit. Note that the narrow ore car track is still fairly intact. The view down into Vincent Gulch taken late in the day. Photo taken near the Vincent Gap trail head. The mountain, back center skyline, is Pine Mountain (elevation 9,648′). The trail head at Vincent Gap. Note the white fire road gate on left. You’ll want to follow the red dirt road that continues past the locked gate. This road will soon narrow to single track, reemerge as a road only to once, again, become narrow single track. This is your route to the Big Horn Mine. The trail sign on the right directs hikers to Mt. Baden-Powell via the Pacific Crest Trail (PCT). A view looking back down at the stamp mill from the upper adit. Note: dilapidated wooden ladder – not recommended for supporting your weight – avoid it! watershed divide between the East Fork of the San Gabriel River to the south and Big Rock Creek to the north. The Vincent Gap trailhead is less than seven miles west of the scenic mountain village of Wrightwood. Remnant road to the Big Horn Mine is now a single-track hiking trail due to numerous landslides on the slopes of Mt. Baden-Powell. The high country peaks of Pine Mountain, Mt. Baldy and Iron Mountain are framed within this view looking out from the Big Horn Mine’s stamp mill. setting. Take care exploring what’s left of the Big Horn. The slopes are extremely steep and exposed. This is a great hike to take in a sense of what mining in the early days of the San Gabriels must have been like. It’s also a wonderful place to take in the grandeur of the wilderness all around you. Remnant platform emerges from the upper adit of the Big Horn Mine. This spot is located just upslope from the stamp mill. Hike Wrightwood – Twenty Good Reasons – At least! 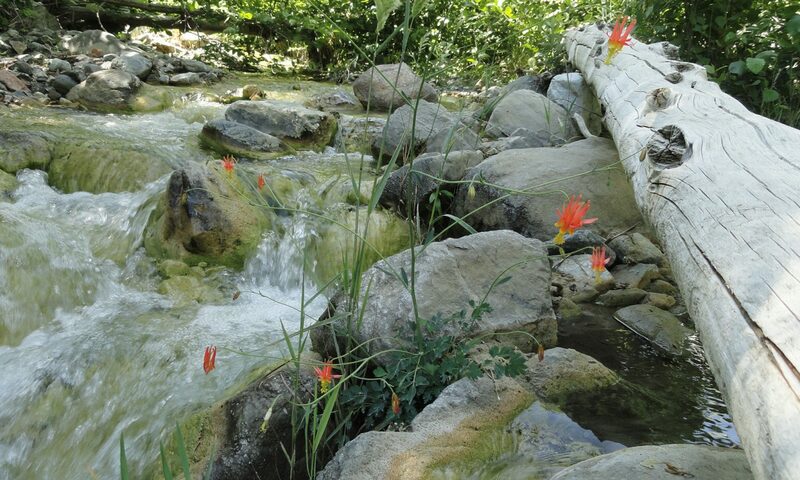 Crimson Columbine grace the fresh, tumbling waters of the East Fork of the San Gabriel River. This scene was photographed just downstream from Mine Gulch campsite at an elevation of 4,500′ in the Sheep Mountain Wilderness. It’s all boulder hopping downstream from the confluence of Vincent Gulch, Mine Gulch and the Prairie Fork. There are at least twenty good reasons to hike Wrightwood during the spring and summer months. While the front country of the San Gabriel mountains swelters under the summer heat and high humidity, there’s a beautiful place in the eastern high country where the air is lighter, cooler and a bit drier, too. Gentle breezes sweep through the pine forests, imparting a restful, freshness to your hike. If you can imagine spanning the ridge top distance between Wright Mountain on the east out to Mount Baden-Powell in the west, there’s a myriad of hiking trails, over 20, to be found among the high elevation pines, fir, cedars and fragrant chaparral. Some of the trails connect places like Jackson Lake with West Blue Ridge, Wrightwood with East Blue Ridge and the Pacific Crest Trail (PCT), Big Pines with Blue Ridge Campground, Vincent Gap up to Mount Baden-Powell’s 9,399′ summit or the descent into the headwaters of the East Fork of the San Gabriel River. Old metal supports from the Big Horn Mine’s stamp mill provide this framed view of Pine Mountain, Mount Baldy and Iron Mountain. Thousands of feet below, the East Fork of the San Gabriel River churns through the Sheep Mountain Wilderness. There’s quite a variety of places to hike Wrightwood that provide you with a sense of of our past, such as the remains of the Big Horn gold mine, which clings precariously to the slopes of Mount Baden-Powell in Mine Gulch. Dating back to the 1800′s, this hard rock mine was worked for decades by tenacious miners, in hopes of golden outcomes. Today its’ stamp mill and mine shafts sit idle, a testament to nature’s relentless taking back of the works of man in mountainous places. If you look around the old Big Pines Lodge at the heart of what was once Big Pines County Park, founded in the 1920′s, classic rock work fringes rock walls and staircases from an era gone by. Walk the Big Pines Nature Trail or head down to the old ice skating rink near the Arch Picnic Area to catch glimpses of where cabins once stood amongst groups of campers and snow players. An ancient Limber Pine straddles the ridge top just prior to arriving at the summit of Mount Baden-Powell. Some of these beautifully gnarled pines are nearly two thousand years in age and are found near the upper end of the Pacific Crest Trail that connects Vincent Gap’s trailhead with the summit. Hiking up to Mount Baden-Powell or dropping down into the canyons from Vincent Gap provide for a wonderful variety of terrain and plant life. Regardless of your conditioning and time available, there’s a trail here for you. If carrying a trail map appeals to you, there’s a large scale, hand-drawn map that highlights twenty hikes in the Wrightwood – Big Pines area of the San Gabriel mountains, providing a brief description of each hike experience with rise over run. The map is very accurate, easy to read and has been field checked throughout. Contour lines have been purposely omitted to provide a clear, uncluttered overview of the local high country trails. The Wrightwood – Big Pines Map is available online with free shipping or can be found at Mountain Hardware and the Wrightwood Market in the quaint village of Wrightwood, CA. Happy Trails from Chris at Canyon Cartography! Heading back up the Manzanita Trail toward Vincent Gap. Western Wall Flowers and Indian Paint Brush signal the advent of the summer hiking season. Looking east across the Sheep Mountain Wilderness. The three peaks that make up the skyline are from left to right, Pine Mountain, Dawson Peak and Mount Baldy. This photo was taken from the Pacific Crest Trail just before arriving at summit of Mount Baden-Powell. Contour lines have been purposely omitted, providing clarity and a sense of open space between the trails, roads, points of interest, as well as natural features such as streams and summits. This is a map intended for the use in traveling hiking trails, fire roads and local roadways. If you’re planning on hiking cross-country (off trail) in this map’s area, it’s recommended that you travel with topographic maps and are skilled in the use of land navigation. This map is hand drawn using rapidograph technical pens. Trails and streams are hand lettered. The base cartography was provided by using four, 7.5 minute topographic maps of the eastern San Gabriel mountains. The maps used are: Mount San Antonio, Crystal Lake, Valyermo and Mescal Creek. The coordinates for the southwest corner are 34 19′ 32″ N 117 46′ 9″ W Coordinates for the northeast corner are 34 23′ 38″ N 117 37′ 38″ W. Projection: NAD 27 CONUS. locate and confirm my location at many points along the various trails and then “draw in” what was actually out there. With the changes that can occur within years and years in steep mountainous terrain, trails and roads can often literally disappear or be significantly re-routed around natural obstacles. Even campgrounds can return back to nature, such as in the case of Cabin Flat, which can no longer be driven into from Lupine Campground. It has now become a trail camp since the road was closed to motorized use. The heart of this mapping project was doing the field checks and then drawing in the changes on the trails located throughout the map’s neat line. Once back at home, I would transpose the field drawings onto a 30″ x 40″ sheet of drawing paper in pencil. A grid was drawn on both the topo maps as well as the working copy at home. This grid technique is quite a time-proven way of preventing distortion and mechanically increasing the size of the map being created. Finally, once I was satisfied with the accuracy of the penciled in trails and other map features, the line work was inked in. The entire drawing was then scanned at 300 dpi on a roller scanner and converted into a jpeg file, making it compatible for editing and colorizing with PhotoShop. From start to finish, this mapping project took just over seven months, providing an overview of the trails bounded by Wright Mountain (East), Mount Baden-Powell (West), Jackson Lake (North) and the East Fork of the San Gabriel River (South). This image was scanned from John W. Robinson’s “The San Gabriels.” A young lady stops for her photo at the First Water Junction on the Sturtevant Trail, not far from present day Chantry Flats. Historic topographic quadrangle from the 1930′s. Following the old Sturtevant Trail toward Chantry Flat today, is to put it lightly, a challenging and slow-moving proposition through thick brush and steep rocky slopes. Built back in 1895 by Wilbur Sturtevant and a cadre of other mountaineers of the time, this trail was once a main way into the Big Santa Anita Canyon during the “Great Hiking Era.” What an amazing time this must have been, 1895 through the late 1920′s, when the mountains rang with the joyous songs of hikers traveling on the myriad of trails through the chaparral and under the spruce, oaks and maples. Alternating through bright glades of sun drenched brush and cool, shady nooks of ferns and shade, the Sturtevant Trail made its’ way up from Chantry’s Store and Corum’s Pack Station in Sierra Madre to Wilbur Sturtevant’s trail resort in the Upper Big Santa Anita Canyon. Pack trains carried construction supplies to such places as Roberts’ Camp, Hoegees, First Water, Fern Lodge and Sturtevant’s, not to mention the construction sites of over 220 private little cabins that dotted stream side flats. Detailed section of quadrangle showing the Sturtevant Trail. Notice that the trail does not show on map past boundary into Angeles National Forest. Lower section of Sturtevant Trail on approach to Lannan Canyon. Here it’s quite intact. While much of the original trail or what I refer to as “tread work” was in place, there were just as many stretches of hillside along the way where any remains of the original tread had long since washed away. So we often found ourselves hiking up slope way more than we needed, searching in vain for the trail or in some cases, dropping far too low as well. Adrian had calibrated his GPS to the historic topographic quadrangle that we had downloaded. Sometimes the blue line from the GPS showed us to be directly on the trail, while at other times we were far from the mark. In the end, there was the ever present hunch or sense of where it might have made sense for the trail to have run. And, sure enough, it would often reappear a bit further on. Much of the terrain is loose and crumbly, while the chaparral was composed mostly of black sage, white sage, buck brush (wild lilac) and sumac. The views are expansive and we found ourselves with constant views of the Chantry Road between Sierra Madre and Chantry Flats, where at road’s end, the trailheads, ranger station, picnic area and Adams Pack Station are located today. Although we never made it the entire way out to Chantry Flats, the experience really did give us a sense of what the hike up from Sierra Madre would have been like back before the Chantry Road existed. Chris Kasten as seen on Sturtevant Trail in Lannan Canyon. Notice Chantry Road in background. A wide piece of the trail’s “tread” is seen here under a tunnel of brush. We often had to crawl through places like this. Adrian as seen on a piece of the old Sturtevant Trail not too far from Roberts’ Halfway Rest, now a communications site on the Angeles National Forest boundary. Today, the old trail is slowly being reclaimed by the Earth. Red tailed hawks circle amongst thermals on the warm, shaggy slopes. Lizards and wood rats go through their daily routines amongst the forest of brush and scrub oak. The plants quietly grow and blossom, season after season, filling the breezes with mingled aromatic scents. Yet, if you’re quiet enough and get still, you can still sense the plodding of pack trains and laughter of hikers, seeking out good times in our mountains eternal. Although the old Sturtevant Trail has been gone now between Sierra Madre and Chantry Flats for the last 80 years, her traces still remain. The Sturtevant Trail is still pretty intact as it makes this turn into a little side canyon between the Little Gray Inn and the Halfway House. Looking back over the route that the Sturtevant Trail once took. That’s the Chantry Road winding below the old trail. There’s only the faintest outline of the once busy Sturtevant Trail left on this chaparral cloaked slope. This spot is located just below the Halfway House.